Lauren Nicole London is an American actress, model and television personality. Beginning her career in music videos and later transitioning into film and television acting, London earned recognition for her performance as Erin "New New" Garnett in the 2006 coming-of-age film ATL, as well as the television shows 90210 and Entourage, and as Kiera Whitaker on the BET comedy-drama, The Game. 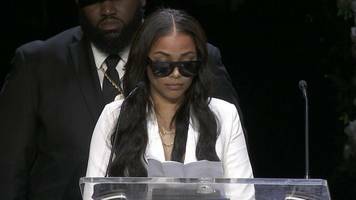 Lauren London speaks at a memorial service for the rapper, who was shot dead in Los Angeles. Nipsey Hussle's fiance, Lauren London, remembered the rapper during the “Nipsey Hussle: A Celebration of Life” memorial. 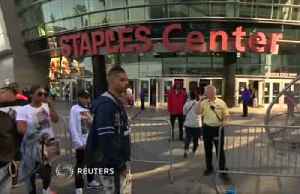 More than 20,000 fans have paid tribute to US rapper Nipsey Hussle during a public memorial in Los Angeles. 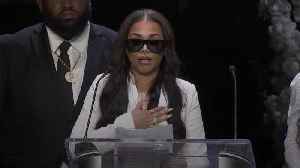 Stevie Wonder, Snoop Dogg and Hussle's fiancee Lauren London remembered the musician who was..
Thousands of people streamed into a public memorial in Los Angeles on Thursday for slain rapper Nipsey Hussle, who was gunned down in the city last month. Hussle's girlfriend Lauren London, rapper..
Rapper Lil Wayne‘s son Cameron Carter says he dreamed of Nipsey Hussle in heaven. Carter is the first son of Lauren London, Hussle's girlfriend.